July 03, 2011 by Alphageek in "alphageek", "review", "urbanspoon"
June 24, 2011 Some of the best pie I ever had. That is how the discussion started. I asked where the pie came from, and found out it was Floozies Pie Shop. 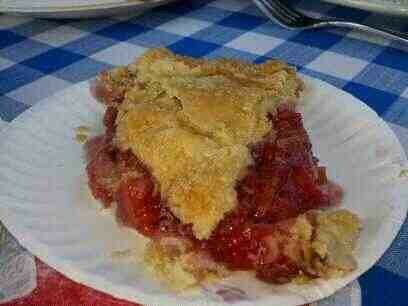 My affection for the strawberry-rhubarb pie in front of me started out simply. I pulled out my droid x, and started searching. I found out Floozies Pie Shop had not been around that long. I made it a point right then and there, to make sure this establishment is on urbanspoon, and to make sure that I posted a review. Now that they are on urbanspoon, you are reading my review. First off, the Alphageek is not really a pie person. I am not an expert, nor have I had a lot of pie. It is not something I think much about. That may have now changed, at least for a little while. I took my first bite of my strawberry-rhubarb pie, and was taken to another place. I had no idea that pie could taste this balanced. I am used to overly sweet pie, that sort of tastes like that frozen pie filling in the grocery store. Floozies simply gave me a balance of fruit that amazed me. The crust is light tasting, not overpowering, and somehow magically holds the pie together, until the last bite is on the plate. I have also sampled some chocolate pie, some key lime pie as well as rain forest crunch. They were made with the same care and deliciousness of the other piece of pie above. Stop by and try a piece sometime. You might want to call ahead at 540-967-1124, they are so new they are not on google maps yet, so I will try to get an update here when google maps figures this out. Here is the best I can do for a map at this time.